I’ve moved to Keller Williams Realty Professionals, Portland West Office! I joined another firm briefly but it wasn’t long before it became clear our relationship (the brokerage’s and mine) probably could have been a better fit. There is no particular reason for this – call it a gut feeling. When an agent cannot confidently carry the vision of a brokerage with them as they do business, it does the neither the agent, nor the firm, any good to carry on despite the obvious. I’m a practical person and the practical thing to do was move to an agency where I felt a better fit. When an agent makes the decision to move, the parting-of-ways is commonly congenial, the managing broker says, “We understand you need to do what is best for you, we wish you the best of luck, and if you ever decide to come back, our doors are always open.” In this industry, we are always running into one another. It is best to keep every communication, no matter what the situation, on the best possible terms. If that isn’t the message the departing agent receives when she or he leaves, the decision to move is a particularly good one. Who wants to work for an agency who prefers sour grapes over wine? You’ll find, most of us in the Real Estate Industry are pretty good at keeping things comfortable. This is particularly easy to do when we, ourselves, as independent business people, are comfortable with the agency we work with. I have been at Keller Williams Realty Professionals barely a week and I can already tell Keller Williams and I will have a long and rewarding relationship. I have been greeted warmly, I am encouraged to be myself, I am encouraged to build my own brand over time, and the company supports agents who want to work in teams to divide up the work so they may better serve their clients. The agents I have spoken to at the office and out in the field, all seem to be happy and focused on building strong and ethical businesses while living a balanced and fulfilling life. That’s precisely what I wish to do and I am so very pleased to have finally found a place that I feel comfortable. 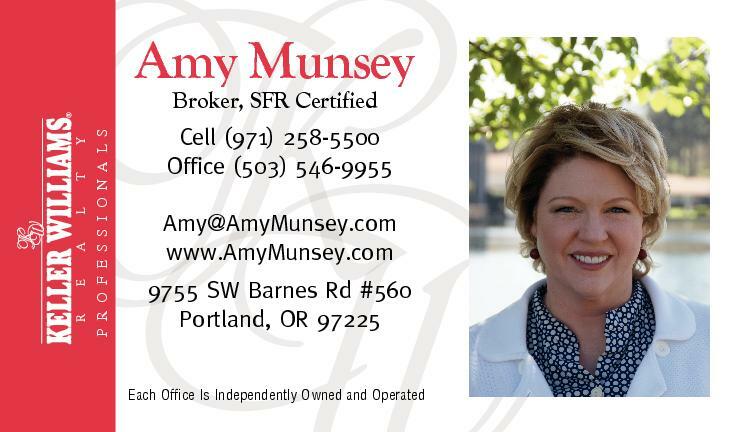 Please visit my website at http://www.AmyMunsey.com to check out any of the hundreds of listings offered by Keller Williams Realty Professionals or to browse local listings by neighborhood. As my business evolves, so too will my website. All of this occurs so that I can better communicate with you, and so you feel better served by me. I am grateful to those of you who read my blog. It is about living in the Portland Area, doing business here, and building a balanced life. On another note: My husband and I walk in the evenings. We live in a hilly neighborhood with an elevation gain of about 600 feet from lower portion to the top of Nansen Summit Park. We try to meander our way to the bottom, and back up to the top once a day. We are currently renting as we ‘try on’ different Lake Oswego neighborhoods, and sometimes our little explorations of Mountain Parks miles of trails find us in unexpected grottos, parks, or climbing up some very steep greenspace pathways. Yesterday, we investigated a route we haven’t yet walked. When we reached the bottom, we came to a hidden park that is only accessible by trail. Houses back out onto the park and residents who live close to it know about it, but we’d not seen it yet. It is beautiful! And it was virtually empty! We encountered another walker and I asked him if he would please share with us a little about this beautiful hidden park. He stop[ed and we chatted for about 30 minutes. He told us about where he lives and about other good routes to walk that reveal other hidden assets. We were both completely smitten with the park and vowed to listen for homes that may go up for sale near it. It would be a wonderful neighborhood (within the large Mountain Park neighborhood) to live in. Sometimes you just never know what you may find! It’s part of what I love about my job. A Wonderful Time for an Adventure!